EURUSD has declined considerably after finding strong resistance level on the three-month high of 1.1570 on January 10. The world’s most traded currency pair is now ready to re-test the short-term ascending trend line, which has been holding since November 12, while it dropped below the 20- and 40-simple moving averages (SMAs) in the daily timeframe. Looking at the technical indicators, the RSI is losing momentum beneath its neutral threshold of 50, while the MACD oscillator is flattening near the zero line following the bearish crossover with its trigger line in the positive zone. Yet the latter could also be an indication that the downward rally is overdone, and hence a rebound on the diagonal line should not be a surprise in coming sessions. Penetrating the aforementioned diagonal line and moving lower, support is expected to come around 1.1310 where the price stopped on January 3. Should this prove a weak obstacle, the selling could pick up speed until the 1.1265 low, where any violation could bring more pressure to the market, with the price probably stretching further down to test the 17-month low of 1.1215. Alternatively, in case of a rebound, immediate resistance could come from the 40- and then from the 20-day SMAs currently at 1.1385 and 1.1420 respectively. Higher, the 23.6% Fibonacci retracement level of the downleg from 1.2550 to 1.1215, near 1.1530, could also restrict upside movements, while a run above this barrier could lead prices towards 1.1570 again. 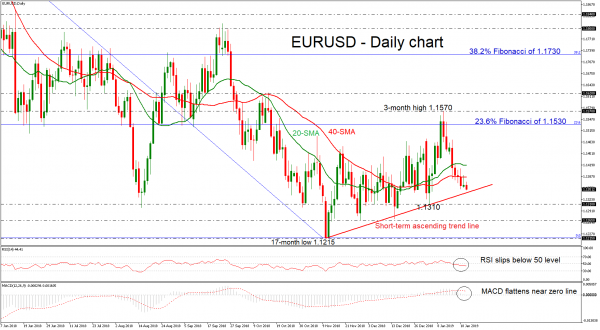 In the short-term picture, EURUSD is still increasing bullish tendency as long as it moves above the rising trend line, but in the long-term view, the price has been remaining in negative structure since February 2018.